We believe that rudderless sailing allows the novice sailor to improve boat balance, sail trim and centerboard control much more directly. The rudder provides a guarantee for your point of sail whereas rudderless involves maintaining your point of sail by understanding and feeling all the forces on the boat. Aside from its help in managing rudder failures, we believe that rudderless gives the sailor a better intuitive sense for how to trim and balance a boat; which is valuable for performance sailing, sail trim and general good form. A few motivations for this guide. First, we’d like to mention Joel Brand’s e-book Rudderless Sailing from 2013 as an excellent review of rudderless sailing theory. We are also inspired by Harry Morton and Israel Smith’s youtube video “29er No rudder sailing with Dave O’Connor” from 2012 which demonstrates two-handed rudderless on a small 29’er – with a spinnaker! Pretty amazing sailing, and still one of the few videos of rudderless with tacks and jibes. This isn’t to say there aren’t many great rudderless sailors. Yet we feel the lack of examples is because it is currently viewed as an extra skill rather than as a form. We hope to change that. 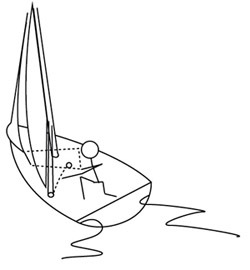 The primary reason for this Practical Guide to Rudderless is to provide a starting point for any club or novice sailor to learn rudderless as a way to intuitively feel the forces on the boat. While we briefly touch on theory, our focus is on a practical guide that helps you to understand what is happening when you’re on the water. Of course nothing can replace actual sailing. So our intention is to give you an idea of what you’re likely to experience, the tools you have to respond to it, and exercises to help you gradually improve. This was a senior project with the Cal Sailing Club in Berkeley! Thanks for their support! Both are welcome below! We’re happy to provide this and hope to improve it.